The new Datamax A-Class family of print engine products are designed to include some of the most innovative features ever found in a print and apply engine. These massive stainless steel workhorses are intended to be an invisible piece of a bigger part of production equipment, facilitating the process of finalizing production through package identification. The A-Class consists of both 4-inch and 6-inch wide print engines with 203, 300, 400 or 600 dpi resolution available in both right- and left-hand models. The Datamax A-Class, as a stainless steel product, is designed to address the specialized corrosion resistant needs found in applications such as the food processing industry. 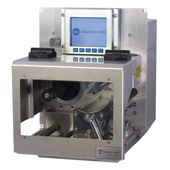 The A-Class was developed for demanding multi-shift, mission critical applications that require optimal throughput from an easy to operate, highly durable print engine. The A-Class utilizes the same electronics card cage design as is found in the popular Datamax I-Class. This allows integrators to choose from a selection of connectivity options to be easily inserted into the card cage. Options include the DMXNet internal Ethernet LAN card, the DMXrfNet internal 802.11b WiFi card, and others. In addition to a graphical display control panel, the A-Class also includes the Datamax/MCL client which enables truly intelligent applications to be hosted within the A-Class itself. 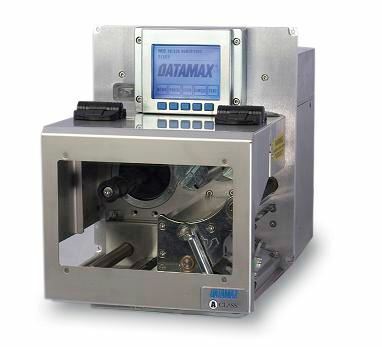 Print and apply integrators and OEMs will appreciate the customization possibilities now available to them through the use of the Datamax A-Class and its MCL application development capabilities.